Symmetra is the most strangely-designed character in Blizzard’s Overwatch. In a game where most heroes’ roles can be summed up in a few words (“fast flanker,” “mobile area-denial tank,” “AOE healer,” “slowing defender”) and their story concepts naturally arise from their roles (“time-traveling jet pilot,” “leaping electric gorilla,” “portable DJ,” “cute ice Satan”1), Symmetra makes little sense. She builds many tiny sentries, gives minor shields to allies, builds teleporters, and can attack with either a short-range cumulative auto-aim beam or a slow-moving death orb. This is explained by her being a combination architect and sci-fi construction worker, shaping solid forms out of light. She is the only character with “photonic” technology, and it is not explained how being able to project physical holograms also lets you bend space and time to craft a teleportation portal. I have no special insight into the Overwatch design process, but I can speculate with some confidence about how it proceeded. Symmetra (and indeed all the heroes) were not designed from the ground up. They were assembled using an accretive process, where abilities were assembled piecemeal and then unified with a story-based concept. Overwatch‘s design pedigree is two parts Team Fortress and one part DOTA. The concept of a first-person shooter where classes perform specific roles comes from TF, but its classes lack character and are a bit too mechanically similar2. Team Fortress 2 makes the characters distinct in appearance and personality, but they all play similarly enough with the exception of the specialist classes (Engineer, Medic, and Spy). As TF2 developed, new weapons were released that allow a wide range of customization of classes and, in some cases, complete overhauls of class roles3. This customization increased play diversity while further blurring the roles of the characters. Other games that Overwatch borrows concepts and abilities from include the Borderlands and Left 4 Dead series, Diablo II and the games it inspired, recent Call of Duty games, and Titanfall. DOTA is a modification for Warcraft III that popularized the MOBA form of games. It features very many (over 100) heroes which are very distinct in appearance and design (from wizards and stone giants to floating balls of light and two-headed dragons). Beyond basic attacks, heroes have four distinct, hero-specific abilities with cooldowns, including an ultimate ability with major utility. This short list of powers for each hero mitigates the learning curve for such a large roster, but the game itself is enormously complex with a wide array of items to buy, experience and gold resources to manage, and esoteric systems involving certain elements of the map. Overwatch is a clear attempt to transform TF through the DOTA lens. The varied roles available in TF2 and other FPSes were enumerated, broken up, and assigned to individual heroes. Each hero has at most five abilities, usually a primary attack, an optional secondary attack, a movement ability, a situational utility, and an ultimate ability. Some heroes replace one or more of these with a passive bonus of some sort. Some heroes are much more useful in certain modes or game phases. Some heroes are “hard counters” to others, guaranteeing a one-on-one win: for example, the sniper Widowmaker can destroy Torbjörn’s turrets from outside their range and kill him easily. Look at the adaptation of the mechanics for the Sniper from TF2. He has the option of a sniper rifle or a bow; his rifle was given to Widowmaker while his bow was given to Hanzo. His primary utility ability Jarate, which makes enemies take more damage, was adapted and assigned to Zenyatta in the form of that hero’s Discord Orb (and in a different way as Ana’s heal/harm grenade). Virtually all heroes’ abilities are inspired by either abilities in other FPSes or by prominent cheats or hacks (e.g. Soldier 76’s autoaim or Hanzo/Widowmaker’s wallhacking). The developers created a concept, picked abilities that matched that concept, and then polished until ready for play. What, then, of Symmetra, the turret-building microwaving teleporter? The answer lies in the game’s role system. These heroes are designed to do damage, kill enemies quickly, and push the line of battle forward. They all have reliable mobility and escape abilities, relatively low amounts of health, and an ultimate that is difficult to run away from. These heroes are designed to keep enemies out of an area, allowing other players to focus on another goal. They all deal their primary damage in some limited way: close range, through a scope, or indirectly. They may have circumstantial mobility abilities but they are not particularly useful in a retreat. 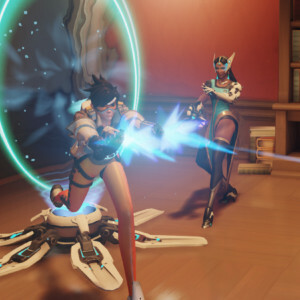 Their ultimates (with the exception of Widowmaker) force enemies to choose to either leave an area entirely or (sometimes) focus on a single target. These heroes are designed to absorb damage, reducing the amount of damage their allies take. They have high hit points and the ability to either entirely negate damage or heal a large amount of it4. Their ultimates are either distracting or disruptive, forcing enemies out of a set formation. These heroes are designed to increase the effectiveness of their allies through force multipliers. This often takes the form of healing, increasing the time that players can fight before dying or retreating. However, each hero also has other force multipliers such as speed or damage boosts. Their ultimates all negate the effects of ultimates and major offensive pushes. Every hero fits rather well into its role. Occasionally a hero will branch out a bit, but never enough to take the place of a hero from another role. For example, Soldier 76 can drop a healing field for his allies, but it is limited in its power compared to the healing abilities of most supports. Symmetra is a support. However, I am quite sure that the designers did not say “We want a support character who summons objects from light.” They must have done the opposite: sort abilities into what role they were most appropriate for, determine what abilities seemed to mesh together, and then looked at those clusters of abilities and created a character around them. This design process is accretive: it assembles the character from basic components taken from the game’s inspirations. 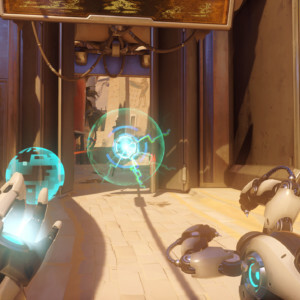 Several of Symmetra’s abilities are inspired by the Engineer from TF2: her turrets and teleporter. The Engineer’s most notable ability, an upgradeable turret, was assigned to Torbjorn as it fits solidly into the Defense role—it discourages enemies from entering its range of fire without immediately destroying it. The teleporter, however, is definitively a support ability. Because part of the cost of death in TF2 and Overwatch is the time spent running from the spawn point to the battle line, the teleporter is equivalent to a slightly-delayed resurrection. Because of the designers’ dedication to keeping roles separate, it had to be assigned to a support class, not a defender. It seems likely that the designers then considered how turrets have two functions: they protect an area, yes, but they can also serve as force multipliers. The Engineer’s turret, unlike Torbjorn’s, knocks an enemy back when it hits it. It thereby slows the speed of advance of any enemies, giving your allies more time to attack them. Strangely enough, even the constant damage of a weak turret can be thought of as a force multiplier. If it’s not enough to kill an enemy faster than they can heal, it is equivalent to enhancing the damage of other attackers. This, then, was the seed for Symmetra: let the defensive half of the Engineer’s abilities go to Torbjorn, and create a support with the other half. Building teleporters and weak, slowing turrets allows her to fill an excellent support role, but just building things and hiding doesn’t make an interesting character. How, then, to flesh her out? Something you often see on web forums is a plea for Symmetra to be recategorized into the Defense role instead of Support. Often cited is her lack of direct healing. Indeed, a recent patch changed a warning on the hero select screen from “No Support Heroes” to “No Healer” and excluded Symmetra from it. All Support heroes have some form of healing, and Symmetra, despite objections, is no different. Hers, however, is less obvious. Symmetra can give any allied hero 25 extra shields; a relatively negligible amount. At first glance this is a weaker but more reliable version of Torbjorn’s ability to spend “scrap” to provide 75 armor. However, this ignores an important aspect of shields. Shields recharge. If a hero with a Symmetra shield survives an encounter with the enemy and avoids taking damage for three seconds, the shield regenerates at a rate of around 20 HP per second. This means that, just after a fight, with a full complement of shields on all five allies, Symmetra effectively heals 100 HP/s: faster than any other hero except Ana without needing to aim or even maintain line-of-sight. Additionally, because allies’ health totals are increased, the extra shields prevent more fragile characters from dying quickly5. 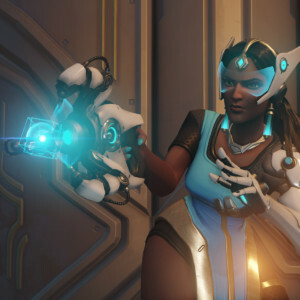 Symmetra, then, has become a proper support: she can resurrect with her teleporter; enhance the effectiveness of her allies with her cheap, weak, slowing turrets; and give every character a bit of extra, regenerating health. But what does she do once she’s set up all her structures and given everyone shields? She needs some sort of attack. Here is where I think the design process for Symmetra changed from accreting a collection of cool abilities to making a hero that worked. These abilities add up to a sort of “mastermind” character: someone who makes everyone else more effective by keeping them in the fight, returning them to the fight, and deciding what zones her allies will be more effective in. All she needs beyond that is the ability to deal with any difficult situation that could possibly arise. 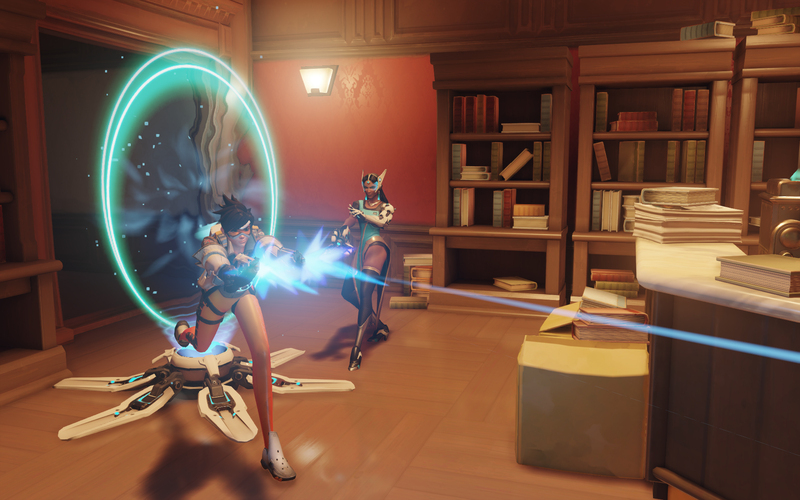 Symmetra’s primary weapon has two wildly different modes: a short-range, auto-aim beam that increases in power over time and a long-range, slow-firing ball of energy that slowly travels through all heroes, shields, and hero barriers except D.Va’s Defense Matrix and Genji’s Deflection. The beam is useful to repel flankers and tanks while furiously dodging, since it is hard to avoid and does incredible damage once charged up. 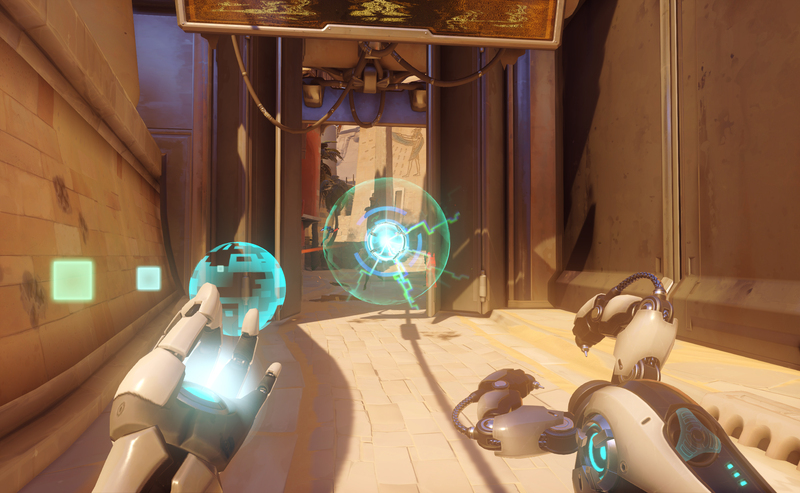 The energy ball will kill any hero except a tank in two shots, but is very easy to dodge. Its role is therefore a disruptive one: it is highly effective against tightly-grouped enemies, turrets, and enemies hiding behind a barrier like Reinhardt’s. The enemies must either move or take serious damage. With these two weapons, Symmetra has tools that let her support her allies against flankers, entrenched positions, and well-organized pushes. Her other abilities let her provide support to her allies even when dead (indeed, she seems one of the most likely heroes to get “Play of the Game” while waiting to respawn). She is too fragile to be a dedicated defender or tank, and her damage is too situational to be a good offense hero, but she provides excellent support to her allies. Viewed as the result of a gradual process of assembling abilities from a pool of inspirations, Symmetra’s eclectic design makes much more sense. She can be seen as the Support half of TF2‘s engineer with a sprinkling of fire-and-forget healing and a pair of weapons that help a team deal with difficult situations. 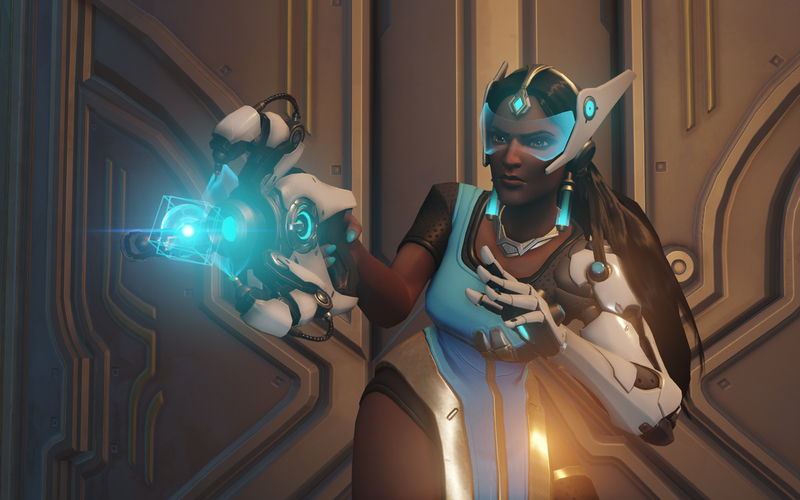 As someone who plays Symmetra as one of my main heroes, I suspect that she is underappreciated in the current competitive scene; she’s a complicated hero with deep strategies surrounding structure placement and weapon usage. I look forward to someone cracking the Symmetra code and elevating her into a more competitive spot in high-level play. Speaking of cracking codes, Blizzard is now teasing a new hero, Sombra, in earnest with an ARG involving hidden waveforms, an encrypted message, and a barcode painted on the literal sky of a map. If you’re wondering what abilities Sombra could possibly have, I suggest looking at what abilities in TF2 are unaccounted-for. Most notably, look at the character of the Spy, whose ability to disguise and cloak has not yet been added to Overwatch. I can’t wait to see how Blizzard interprets his abilities.